National Demolition Association member Dallas Contracting Co., Inc. (Dallas Contracting) was contracted by TRC Environmental Corporation to demolish the entire facility including slabs, foundations and footings. The facility consisted of six (6) multi-story buildings with a footprint of nearly 100,000 square feet. From a redevelopment standpoint, the site will eventually be turned into a residential development. The first task was to disconnect all utilities in order to isolate the facility. Dallas Contracting coordinated the disconnection of water, gas, electric, sewer, phone and cable utility lines. The next priority was to address the environmental hazards present at the facility. The environmental hazards included lights and ballasts, miscellaneous containers of oils and greases, and the abatement of asbestos containing materials. Light and ballasts were collected utilizing ladders and electric lifts, placed into shipping containers and shipped offsite for recycling. Containers of oils and greases were also collected into 55 gallon drums and properly recycled offsite. Asbestos abatement of asbestos containing materials was also conducted and included abatement of pipe insulation, roofing, flashing and tiles. Once the environmental hazards were addressed, building demolition commenced. To complete the demolition of the facility, Dallas Contracting utilized numerous pieces of equipment that included a Komatsu PC-400-LC6 mounted with a Labounty rotating shear (MSD-70R), a Komatsu PC-400 mounted with a concrete pulverizer jaw attachment, a Komatsu PC300-5 mounted with a grapple (also used with a shear attachment), a Komatsu PC200-LC6 mounted with a grapple, a Fiat wheel loader and several Cat 236 skid steers. The site crew averaged 8- 10 personnel which consisted of equipment operators and laborers. 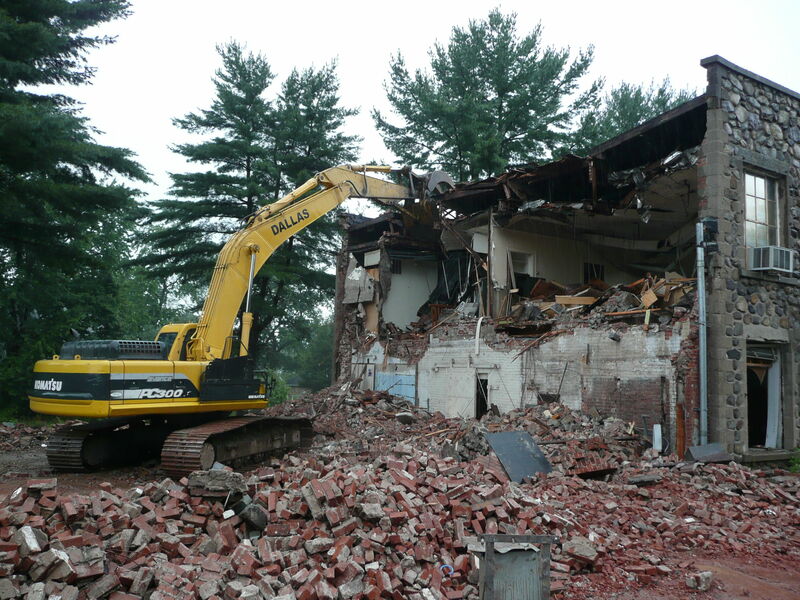 Demolition included all above grade structures and also all slabs, foundations, footings and other miscellaneous subsurface concrete structures. Approximately 500 tons of steel were sent offsite for scrap metal recycling. Following demolition of the buildings including the slabs and foundations, the concrete, block and brick materials needed to be crushed to 2 inch minus for use as onsite backfill. Dallas Contracting first sized the materials into 2 foot diameter or less by using a Komatsu PC-400 mounted with a concrete pulverizer and a Komatsu PC-300 mounted with a hydraulic hammer attachment. The sized materials were then fed into Dallas Contracting’s concrete crushing plant. Dallas Contracting owns an Eagle Crusher Company, Inc. UltraMax 1000-15CV Plant with stacking conveyors. Approximately 8,000 tons of concrete, block and brick were crushed which was used onsite for backfill. This was a dual benefit to the client as they did not have to pay to send the materials offsite for recycling and they did not have to pay for imported backfill material. The project was completed in approximately 2 months without incident or injury.